This entry was posted on Thursday, December 29th, 2016 at 4:17 pm. I am typically not one who complains about the years. There are good and bad days within each and every year, so it’s hard for me to generalize an entire year as bad. But this year was one of those for me, and if social media is any judge, it wasn’t so great for most. The good news is that just about every frustrating or terrible thing that happened has been resolved, and my friends and family are happy and healthy. You really can’t ask for much more than that, can you? However, starting this past January, it just felt like it was one thing after another; the hits just kept coming. 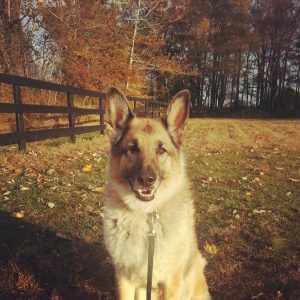 The very worst was losing our beloved German Shepherd, our Izzie, to cancer. I have had many dogs in my lifetime, and I can say beyond a shadow of a doubt that Izzie was the best. She was just extra special and brought an immense amount of love and joy and happiness to every single day. We would describe her to others as “perfect,” because that’s just what she was. Not long after we brought Julep home in October, Izzie just seemed off. She was still running and playing, barking at the horses, and anxious for her daily walks, but she didn’t seem to have her usual pep. On a Friday, she stopped eating. Back to the vet’s on Saturday where a ruptured spleen was found. We rushed her off to the Pet ER (they had a better blood bank should surgery require it), but tumors were found everywhere. There wasn’t anything we could do, so we said goodbye. She would have been ten in January, and we are still absolutely devastated. That was in November. Needless to say, I’m ready to leave this year behind and start fresh in 2017. We did have some productive and happy moments though. The hall bathroom was renovated (but not without a huge issue with a contractor – I’ll post pictures soon). We completed some smaller odds and ins around here, updated some things that needed to be done that no one sees (like the pump sump, parts for the boiler, boring house stuff like that! ), and took some fun vacations. We also added our rescue dog, Julep, to the mix, and have since brought home another Shepherd, a 7 month old named Gemma (more on her later). Also, I published my first book, Where the Bluegrass Grows!! After 5+ years of dragging my feet with it, I finally released it to the world. If you happened to have read it (and liked it), it would mean so much to me if you would write a review on Amazon! What will 2017 bring? Of course no one knows, but I’m hoping for, if not a better year, at least one that’s a bit less sad and stressful. Happy New Year to all of you! May 2017 bring you good health, peace, and happiness! Thanks for stopping by!